Registered Users: once you have created your own account (see below) you can use your login/password to authenticate with Tuleap. Registered users have access to all Tuleap projects including source code unless the project administrators decided otherwise. And since the system knows about you, it enables you to customize your view of the system through your Personal Page, monitor Forums, software release, receive support request follow-ups, site updates and many other useful things. Anonymous Users: when you first visit the Tuleap site you are typically an anonymous user. Anonymous users can browse the site but many of the resources cannot be used or accessed by an anonymous user. 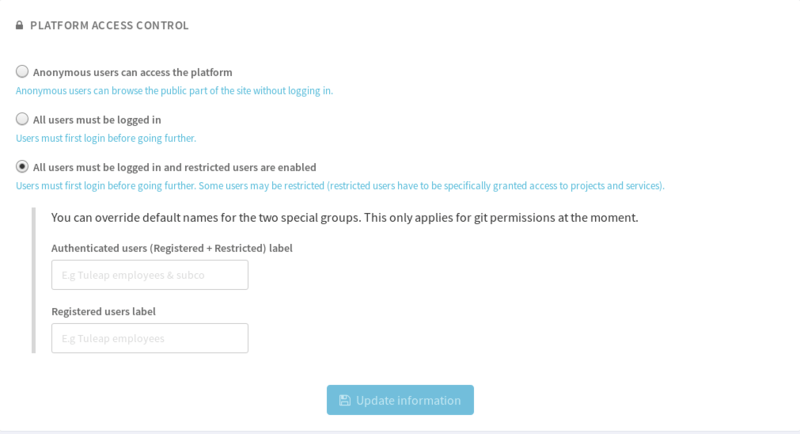 Restricted Users: users who are project members, or even project administrators, but with restricted access rights: they cannot access pages from projects they are not a member of. This special role is only enabled on servers in heterogeneous environments where corporate users and external consultants share the same server. The permission model of Tuleap is first defined by the platform configuration. This configuration is done by a site administrator in Admin > Configure anonymous and restricted access section.